Have you wondered why the cost of your dream home suddenly became a nightmare. With housing affordability at explosive levels and every investor and bank covering their pocketbooks there was nowhere for house prices to go but through the roof. Now we have to try and unscramble the omelette , but in the end it’s the new buyer that will foot the bill. 1. a confidence game or other fraudulent scheme, esp. for making a quick profit; swindle. And what a confidence game it was. 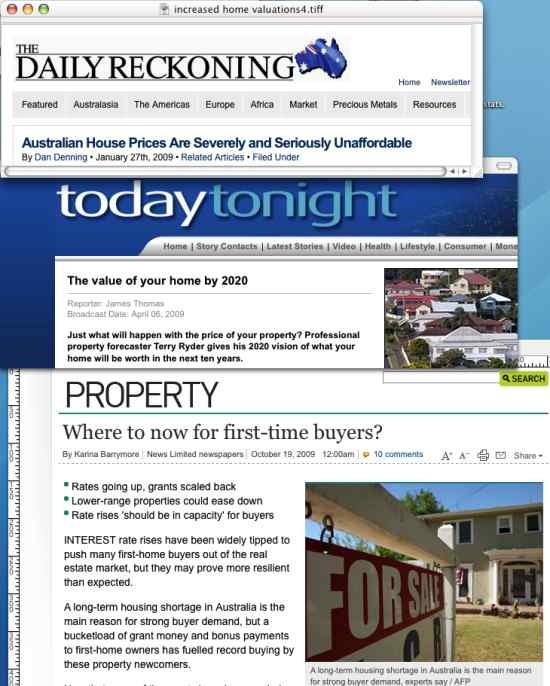 The orchestrators of this scam had all a range of confidence building quotes – “House prices double every 7 to 10 years”, “Better buy now or miss out for ever”, “Buy now, worth more tomorrow” and in times of falling share markets, “Safe as houses”. As the US economy took a dive and along with it house prices, sayings such as “It’s different here”, “There is a shortage of houses” and “High Immigration is putting a floor under prices” sprung up. Now that our house prices are following suit, “It’s never a better time to buy” and “housing is a long term investment”. 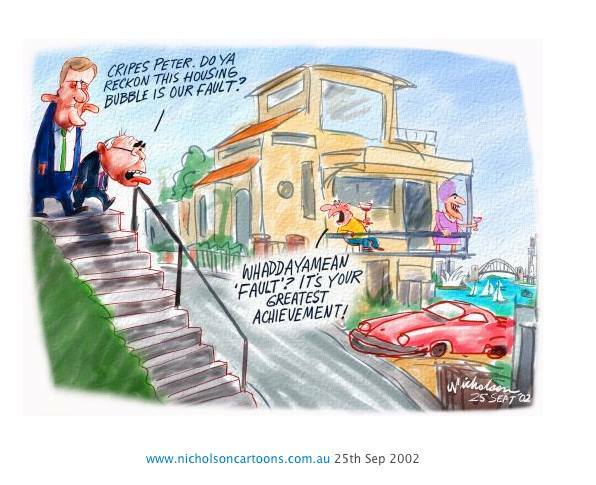 That’s right, this scam was the great property bubble aka property swindle. The aim for investors in this fraudulent scheme was simple – making a quick profit. As house prices only went up in value, all you needed was an interest only mortgage to cash in on the capital gains. Rental yields? What yields? The property lobby groups had the interests of their members at heart. The higher the price of property, the bigger commissions real estate agents make on their sale. As buyer confidence increases, so does the turn over. The mortgage brokers only cared about writing loans. They didn’t keep them, so it didn’t really matter if the mortgagor could afford it or not. That would be someone else’s problem – to package the loans into special purpose vehicles or collateralized debt obligations (CDOs) and flog them off to unsuspecting parties. When too many of these CDOs cause concern for credit worthiness or the possibility of default, just take out a credit default swap (CDS) contract. via Who crashed the economy » Blog Archive » The Scam of the Century. New figures have blown 2005’s ‘City of cities’ report out of the water, with predictions the population of Australia’s biggest metropolis will balloon forty percent to six million over the next thirty years. The Minister for Planning, Infrastructure and Lands Tony Kelly says Sydney will be a different city. “Sydney, Parramatta, Penrith, Liverpool, they’re the major ones. There’s about seventeen cities altogether but they’ll be the major hubs in the future,” Mr Kelly added. In 2036, the population of Sydney city will rise 60 percent to 265,000. The West Central, where Parramatta sits, will rise 32 percent to 897,000. The North West, home to Penrith, will blow out 52 percent to over 1,000,000. Liverpool’s population will double. “The government’s policy is that seventy percent of those new dwelling units will be in existing urban areas and thirty percent will be in Greenfield sites. We’ve got to look at making sure that we have more supply than there is demand and that will make sure that prices are still affordable,” Mr Kelly said. But according to John Edwards from property analyst Residex Sydneysiders are at grave risk of being outpriced from the market forever. “I don’t think that we’re going to be where people would think that were going to be. I think that the result is more likely that we will have high levels of density, we will have moderate rates of capital growth, but very high rental yields. 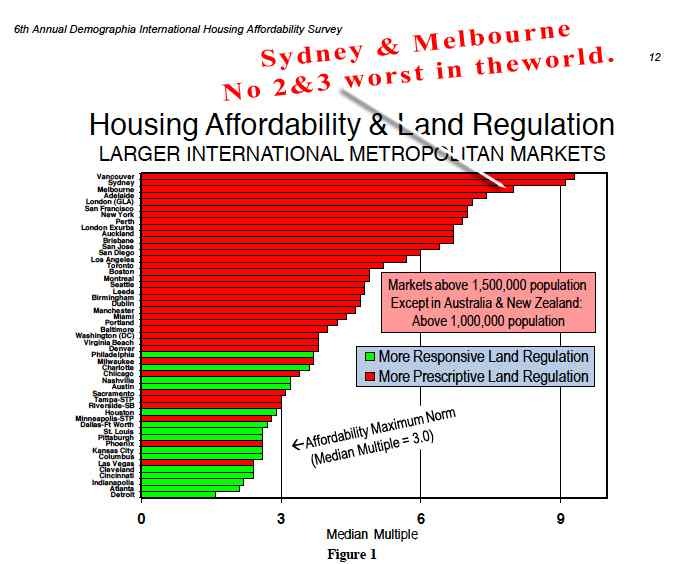 And the reason is that we are bidding houses to inaffordability,” John said. So just how expensive are we talking? According to Residex the $344,500 median house price in Penrith is expected to rise to around $1.3 million. The $395,000 median house price in Fairfield is expected to rise to $1.47 million, with its rent increasing to $1,529.67. And that’s the cheap end of the market. A house in Brookvale will leap from $941,500 to $4,460,196, with its rent climbing to $2,058.45. A house in Randwick is predicted to surge from $1.4million to $6.8 million, with a rent of $1,562.44.